Trout Lake is located directly on the BC Parkway and is a short 500m from the Central Valley Greenway at Lakewood Drive. Simply type in “Trout Lake Farmers Market” as your end goal on GoogleMaps and you’ll find us in no time! Note: There is no bicycle valet this year at Trout Lake. Please make sure to bring your bicycle lock to secure your bicycle while you visit. 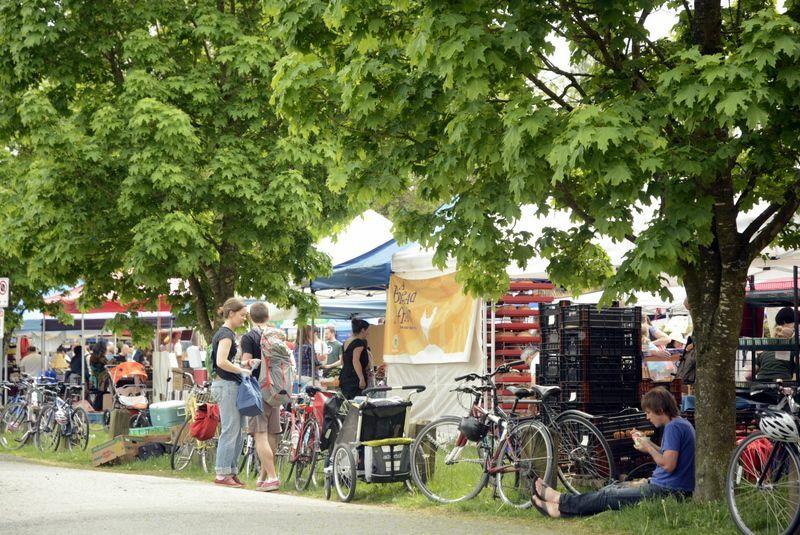 Commercial-Broadway Station is a 15 minute (1.3km) walk to the Trout Lake Farmers Market. Find us by following the crowds of people walking past Safeway with reusable shopping bags! Nanaimo Station is a 20 minute (1.5km) walk to the Trout Lake Farmers Market. We suggest ambling along the BC Parkway to get a glimpse of the Copley Community Orchard and strolling along the lake at John Hendry Park. 007: Coming from Hastings-Sunrise, Downtown, or want the closest bus stop off the skytrain? The 007 stops at Nanaimo and Grandview Hwy a mere 500m from the market. 020: Get off at Commercial and 14th Ave to get within 900m of the farmers market. 009: Want a shorter walk than the 020? If you’re coming from Commercial-Broadway Station or anywhere along Broadway, the 009 will take you within 750m of the market at Lakewood Dr and Broadway. There is no designated parking at the Trout Lake Farmers Market or surrounding areas. If at all possible, please walk, cycle or take transit. Resident-only parking areas are strictly enforced and many shoppers have ended their visit with a parking ticket! If you are driving, we advise that you park outside the area and walk in. A grocery valet pick-up is available for heavy purchases. Just ask for more information at the Market Info Booth. accessible parking: There are four designated accessible parking spaces at the east end of the market along Templeton Drive. These are north-facing between 13th Ave and Grandview Hwy. A ramped sidewalk provides access from these spaces to the market. Please see the map below for location information and City of Vancouver accessible parking info for more info and exemptions.